MOOLY, Geez what a weird name. In Today's 35 mm World of Motordrives, it's pretty easy to forget the very first one. 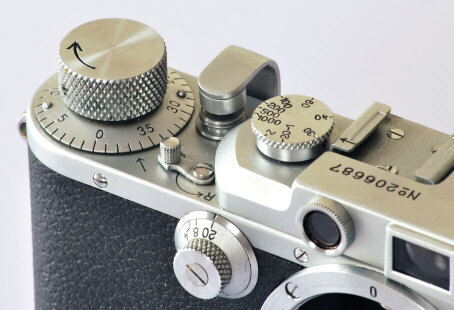 In 1938, Leica introduced the first commercially successful 35 mm motordrive, the mechanical "clockwork", MOOLY. NO batteries! No, I have no idea how or where Leica got the name, other then knowing that Leica used five letter nonsensical codes at that time. Today, they have reformed the process to give us non-sensical products instead, like a manual focus SLR in an Autofocus Age. Sorry 'R' fans, but I just couldn't resist -- Nikon made me do it! The MOOLY is quite an achievement. 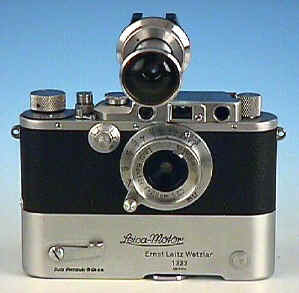 Mega-corporation Zeiss never introduced one for Leica's main pre-war competitor, the Contax. For that matter, neither did anyone else. 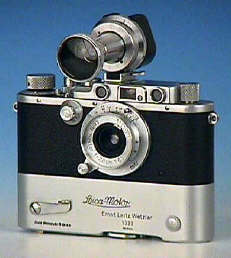 Before the war, Leica often lead the entire camera industry in new technology. For it's time, the MOOLY was a big deal with literally no other choices to do what it did. Amazingly the MOOLY set the future standard for add on motors from day 1 as the MOOLY cleanly attaches to the bottom of the camera. A comparable motor achievement would have to wait until the Nikon SP Motor drive of 1957. The MOOLY and MOOLY C both replaced the camera's baseplate and are spring wound. The MOOLY used an arm to connect the shutter release with the motor. The earlier ones, like this one, were two speeds, a blazingly fast one or two frames per second. On later models the switch was eliminated in favor of the simplicity of a single speed. About 12 exposures were possible on a fully wound motor. The improved MOOLY C was produced for the longer bodied IIIc. The MOOLY C uses internal linkage without the external arm from the motor to the camera's shutter release. The MOOLY C are most numerous in chrome, but also can be found in grey paint or black paint. The wartime grey is rarest. 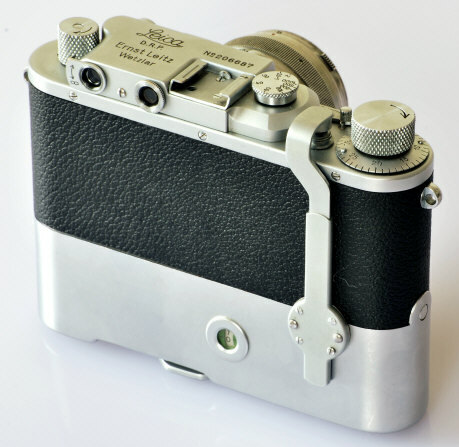 Rarer still are the MOOLY with K markings for the Leica IIIC K cameras -- made both in chrome and grey paint. I'm not sure if the K MOOLY C's used ball bearings similar to the wartime IIIC K bodies, or if they were so designated due to special low temperature lubricants. IF you have a grey or MOOLY K motor for sale, please let me know. Today most MOOLY's are not working. Often they have also lost their linking arm. 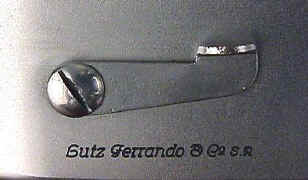 Below the motor switch is the Lutz Ferrando & Co. engraving for the Argentina Leica distributor. 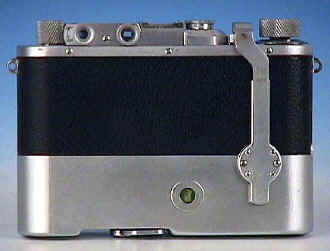 After winding the clock driven baseplate spring, the lever on the front of the MOOLY functioned as the shutter release. 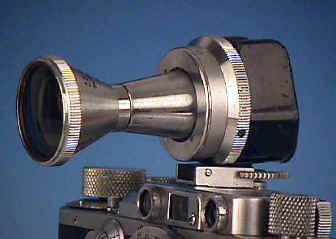 Note the 28/6.3 Hektor with the rare TUVOO viewfinder attachment. The shutter release guard must be unscrewed and removed to mount the MOOLY's connecting arm. Extremely rare are * MOOLY which apparently indicate a duplicate serial number or re-issue from the factory. The chrome button on the front is the switch on the early MOOLY between motor speeds. During operation the MOOLY arm dutifully goes up and down to release camera's shutter release. It's quite old fashioned and charming. Oh I Got the MOOLY Blues. Luv you in the Night. or I ain't Gonna Be Happy Tonight. Revised: April 15, 2010 . Copyright � 1998-2010 Stephen Gandy. All rights reserved. This means you may NOT copy and re-use the text or the pictures in ANY other internet or printed publication of ANY kind. Information in this document is subject to change without notice. Other products and companies referred to herein are trademarks or registered trademarks of their respective companies or mark holders.